The domain within your query sequence starts at position 113 and ends at position 149; the E-value for the BTK domain shown below is 1.1e-21. Zinc-binding motif containing conserved cysteines and a histidine. Always found C-terminal to PH domains (but not all PH domains are followed by BTK motifs). 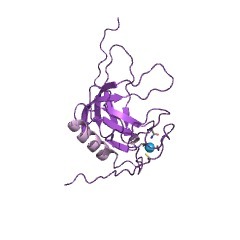 The crystal structure shows this motif packs against the PH domain. The PH+Btk module pair has been called the Tec homology (TH) region. The Btk-type zinc finger or Btk motif (BM) is a conserved zinc-binding motif containing conserved cysteines and a histidine that is present in certain eukaryotic signalling proteins. The motif is named after Bruton's tyrosine kinase (Btk), an enzyme which is essential for B cell maturation in humans and mice [(PUBMED:8070576), (PUBMED:15661031)]. 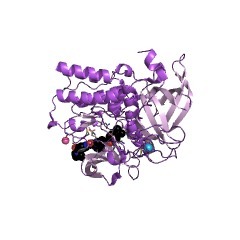 Btk is a member of the Tec family of protein tyrosine kinases (PTK). 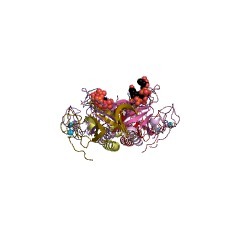 These kinases contain a conserved Tec homology (TH) domain between the N-terminal pleckstrin homology (PH) domain (IPR001849) and the Src homology 3 (SH3) domain (IPR001452). The N-terminal of the TH domain is highly conserved and known as the Btf motif, while the C-terminal region of the TH domain contains a proline-rich region (PRR). 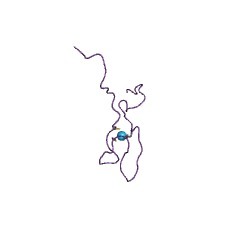 The Btk motif contains a conserved His and three Cys residues that form a zinc finger (although these differ from known zinc finger topologies), while PRRs are commonly involved in protein-protein interactions, including interactions with G proteins [(PUBMED:9280283), (PUBMED:9796816)]. The TH domain may be of functional importance in various signalling pathways in different species [(PUBMED:8070576)]. A complete TH domain, containing both the Btk and PRR regions, has not been found outside the Tec family; however, the Btk motif on its own does occur in other proteins, usually C-terminal to a PH domain (note that although a Btk motif always occurs C-terminal to a PH domain, not all PH domains are followed by a Btk motif). 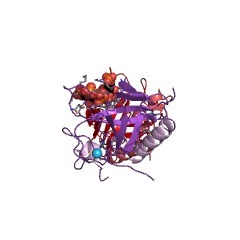 The crystal structures of Btk show that the Btk-type zinc finger has a globular core, formed by a long loop which is held together by a zinc ion, and that the Btk motif is packed against the PH domain [(PUBMED:8070576)]. The zinc-binding residues are a histidine and three cysteines, which are fully conserved in the Btk motif [(PUBMED:9218782)]. 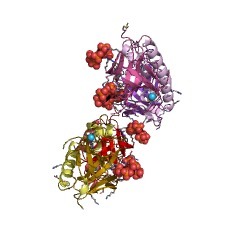 Mammalian Bruton's tyrosine kinase (Btk), a protein tyrosine kinase involved in modulation of diverse cellular processes. Mutations affecting Btk are the cause of X-linked agammaglobulinemia (XLA) in humans and X-linked immunodeficiency in mice. Mammalian Tec, Bmx, and Itk proteins, which are tyrosine protein kinases of the Tec subfamily. Drosophila tyrosine-protein kinase Btk29A, which is required for the development of proper ring canals and of male genitalia and required for adult survival. Mammalian Ras GTPase-activating proteins (RasGAP), which regulate the activation of inactive GDP-bound Ras by converting GDP to GTP. There are 2829 BTK domains in 2827 proteins in SMART's nrdb database. Taxonomic distribution of proteins containing BTK domain. This tree includes only several representative species. The complete taxonomic breakdown of all proteins with BTK domain is also avaliable. Click on the protein counts, or double click on taxonomic names to display all proteins containing BTK domain in the selected taxonomic class. 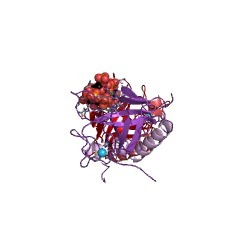 BTKbase, mutation database for X-linked agammaglobulinemia (XLA). Role of Btk in B cell development and signaling. Bruton's tyrosine kinase (Btk), the target of inactivating mutations in X-linked immunodeficiency diseases of mice and humans, is essential for normal B cell responsiveness. Recent studies have outlined a mechanism for the activation of Btk by B cell receptor engagement and have identified proximal and distal targets of Btk action. Missense mutations affecting a conserved cysteine pair in the TH domain of Btk. 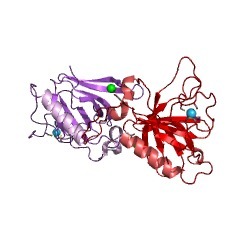 Tec family protein tyrosine kinases have in their N-terminus two domains. The PH domain is followed by Tec homology (TH) domain, which consists of two motifs. The first pattern, Btk motif, is also present in some Ras GAP molecules. 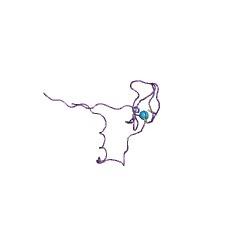 C-terminal half of the TH domain, a proline-rich region, has been shown to bind to SH3 domains. Mutations in Bruton's tyrosine kinase (Btk) belonging to the Tec family cause X-linked agammaglobulinemia (XLA) due to developmental arrest of B cells. Here we present the first missense mutations in the TH domain. The substitutions affect a conserved pair of cysteines, residues 154 and 155, involved in Zn2+ binding and thereby the mutations alter protein folding and stability. SwissProt sequences and OMIM curated human diseases associated with missense mutations within the BTK domain. This information is based on mapping of SMART genomic protein database to KEGG orthologous groups. Percentage points are related to the number of proteins with BTK domain which could be assigned to a KEGG orthologous group, and not all proteins containing BTK domain. Please note that proteins can be included in multiple pathways, ie. the numbers above will not always add up to 100%.